The PROFIBUS Group will be participating in the Sensors & Instrumentation for Test, Measurement & Control exhibition and conference at the NEC Birmingham, UK – 25 & 26 September 2013. We will be presenting a technical session at 15:00 on the first day of the event. Entitled “Overview of PROFIBUS and PROFINET – characteristics and features” the presentation will cover application areas and industries, showing how these flexible technologies can provide open, cost effective and reliable solutions across a range of application areas including factory automation, process control, high reliability and safety related applications. It will encourage potential users that PROFIBUS and PROFINET are economically worthwhile, comparatively easy to use and can give very reliable control. The presenters will also explain the benefits of joining the UK PROFIBUS Group. The PROFIBUS stand will feature some of the tools in common usage for configuring, commissioning and testing PROFIBUS systems. The presentation will be led by our Technical Officer, Andy Verwer ably assisted by other Profibus Group Committee members Peter Thomas, Dale Fittes and Richard Needham. Sensors & Instrumentation is a brand new dedicated exhibition is intended for engineers and technicians in Process, Instrumentation, Design and Maintenance in the Food, Dairy, Beverage & Brewing, Pharmaceutical & Biotechnology, Chemical, Oil & Gas, Automotive and Aerospace sectors. 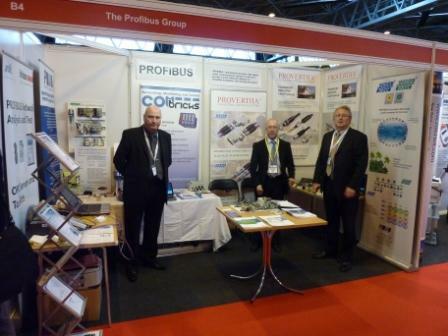 It builds on the success of Sensing Technology 2012 where The PROFIBUS Group played a prominent part in the proceedings. For those looking for new products or simply the latest information, with the enhanced Sensors & Instrumentation 2013 exhibition everything needed will literally be under one roof – from sensors, test and measurement equipment, and other types of instrumentation; to interesting seminars and knowledgeable professionals. This national Sensors & Instrumentation exhibition is now in it’s fourth year and has evolved to meet the demands of both exhibitors and visitors. Organised by leading industry publisher Datateam Business Media and trade show expert Trident Exhibitions, and backed by a wide range of industrial media organisations, this new event is built on the solid foundations of the previous Sensing Technology exhibition.